Subway Phasing Out Bread Additive After Blogger Flags Health Concerns : The Salt Just a few days after a food blogger created a buzz with an online petition raising questions about the safety of a food additive commonly used in commercial baking, sandwich giant Subway has announced plans to phase it out of its fresh-baked breads. Sandwich chain Subway has announced plans to drop the additive azodicarbonamide from its fresh-baked breads. 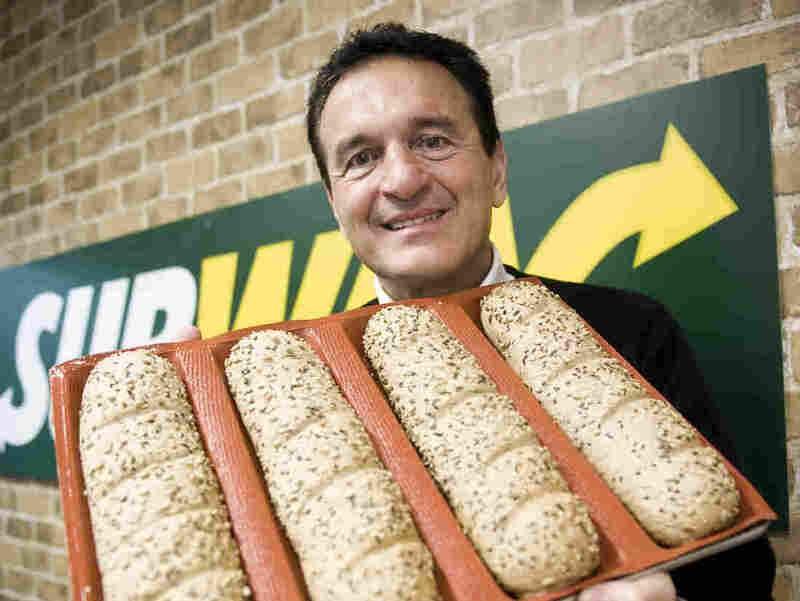 Above, Subway founder Fred DeLuca poses carrying bread for sandwiches. Food industry, beware of the power of the online petition. Just a few days after food blogger Vani Hari, known as Food Babe, created a buzz with an online petition raising questions about the safety of a food additive commonly used in commercial baking, sandwich giant Subway has announced plans to phase it out of its fresh-baked breads. The additive, azodicarbonamide, is used by the commercial baking industry to bleach flour and condition dough. But as the petition points out, the compound has been phased out in many other countries, and the World Health Organization has linked it to asthma in people. A spokesperson for Subway told us in an email, "We are already in the process of removing azodicarbonamide as part of our bread improvement efforts, despite the fact that it is a USDA and FDA approved ingredient." One of the things the online petition points out — which probably helped get people alarmed about this additive — is that azodicarbonamide is also used in the manufacturing of yoga mats and shoe rubber. And while Subway is removing the substance, many other food companies still use it in their products. A statement from an FDA spokesperson says the agency is currently "collecting data regarding the use of azodicarbonamide in bread ... and is prepared to take appropriate action if there are safety concerns." But the FDA says there is "a reasonable certainty of no harm" when an additive — such as azodicarbonamide, which is approved for use in food — is used "within the intended conditions of use." There's no evidence that Subway has ever exceeded the allowable limits on azodicarbonamide it uses in its breads. The Center for Science in the Public Interest says the FDA should move to ban the use of azodicarbonamide in food. "Considering that many breads don't contain azodicarbonamide and that its use slightly increases exposure to a carcinogen, this is hardly a chemical that we need in our food supply," says CSPI Senior Scientist Lisa Lefferts in a statement. She was referring to studies that have linked a breakdown product of azodicarbonamide to cancer in mice. So, when can Subway sandwich customers expect the change? "The complete conversion to have this product out of the bread will be done soon," the Subway spokesperson told us. This is hardly the first time that an online petition has prompted a high-profile food maker to change course. Remember how moms of school kids raised concerns about pink slime in beef served at schools back in 2012? And last year, Kraft Foods announced plans to remove the artificial orange coloring from its mac and cheese products marketed to children after another petition started by Hari gained traction.